This is a Post from the Symbol Surfing Blog from Mon, Aug 27, 2018. Today was the ex-dividend date (ex-date) today for JNJ. I will receive the cash dividend of $0.90 per share in my account automatically on the payment date or (pay date) of Tue, Sep 11, 2018. The other 2 of the 4 "dividend dates" are the declaration date and the record date. 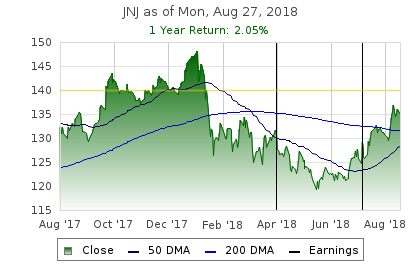 If you are interested, check out JNJ's dividend history. That's why Johnson & Johnson is one of the few S&P 500 Dividend Aristocrats. Many dividend-paying stocks pay dividends on a "quarterly basis". Some dividend-paying stocks pay dividends on a "monthly basis". My opinion is that the monthly dividend is more of a marketing strategy than anything else. Another dividend-related strategy is "dividend capturing". The article below explains it better than I can. In my experience, on the ex-date, it is not unusual for the stock to drop by the amount of the cash dividend. It paid out $0.90 cents in the form of a dividend. Today the stock price dropped by -$1.03. A few years ago, I wrote a script that backtested a few hundred ex-dates on blue chips stocks. I was hoping to find the holy grail. I tracked the stock price the day before the ex-dividend date through a few days after. It was actually a waste of time. Some stocks went up, some stocks went down and others had a small change in price. What I found out is that there seems to be zero correlation between the ex-date and the stock price movement. On this trade I started on Mon, May 21, 2018, I am up about 9% plus the 2 quarterly dividends. According to the chart, the stock price could easily hit $140 or higher if the stock continues this rally.